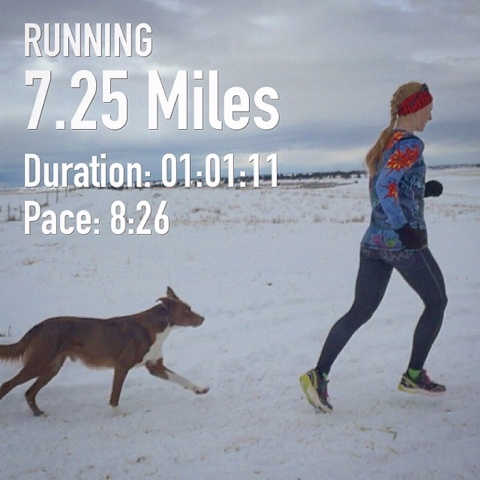 Monday 7.25 mile run on snow covered roads. The kids were out of school so they went sledding at my grandmother's while I ran. Tuesday: 24 minute HIIT in the morning before work. 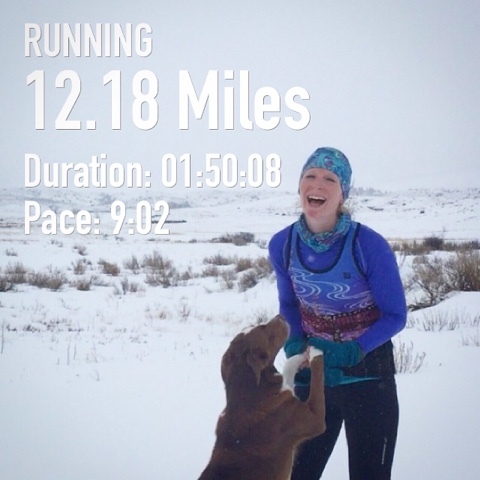 Wednesday: 45 minutes of easy yoga first thing in the morning, 12.18 mile run in a snowstorm/ rain. I knew mentally this would be a tough long run (like the windy one last week) so I started by running with the wind and then on the way back did into the wind/with the wind intervals to break it up. I would run into the wind for half to three quarters of a mile and then turn around and run with the wind for half a mile, some times I would run a mile or more into the wind. It was 3.5 miles to the turn around point and by the time I got back to my car I had run 12.18 miles. So a lot of back and forth, but mentally it helped to not run into the wind so miles and miles with the snow/rain beating me in the face. Seriously so happy to be done with this run! Friday: 15 minute HIIT in the morning before work. I oddly believe that these HIIT workouts before a busy day at work really help energize me. Saturday: 60 minutes of yoga in the morning. and a 7 mile run in the afternoon. and YAY... speed work. Finally! I did quarter mile intervals x6 with quarter mile cool downs in between. The roads were finally good enough to have the traction for speed work and it was a balmy 40 degrees and my legs were feeling good! I didn't think I kicked my dog here, but looking at this picture I am not so sure! Sunday: Busy working on 4-H demonstrations with the kids, my daughter is doing homemade play dough and my son is talking about gun safety. Posters are a lot of work.. but learning public speaking is so good for kids. 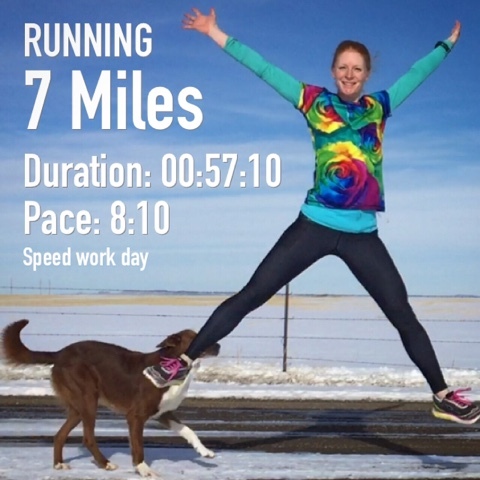 I did get in a windy afternoon run while the Broncos were busy beating the Patriots...yay! I saw the first half and the very end. and I ran in capris! also still participating in Fit Approach's yoga challenge, I think I got in four this week. Predictably my long run this week is scheduled on a very windy day. On the upside it is supposed to be in the 50s, so at least for a change it will be warm and windy instead of cold and windy. I love that your dogs photobomb your pictures! And your yoga poses are beautiful! Looks like a great week of training for you. That was brilliant to break up your long run so you wouldn't be running into the wind for miles on end. 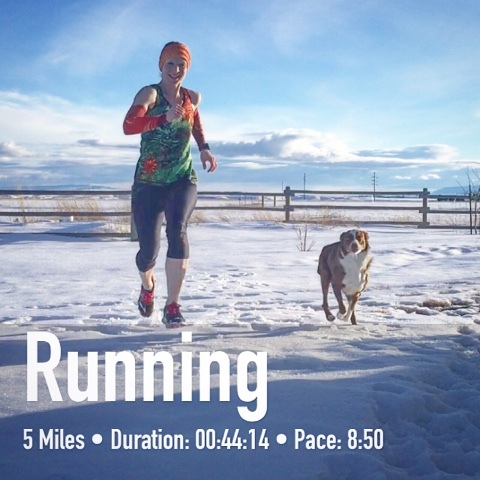 It's been too icy here this winter for speed work outside. I should be more diligent about doing some on my treadmill, though. Your dog looks totally happy and unfazed (so probably not kicked) in that shot! 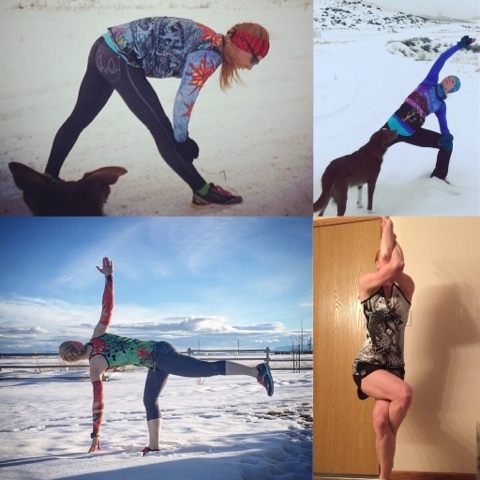 Capris and bare shoulders with a background of nothing but snow...You are beast! Seriously how cold is it? I do run with my dog but where I run I can't let him off the leash much. I will sometimes in the campground when no one is there, but I have to be careful cause he does like to chase the deer. :) He does love to go though. Great job on your runs and the awesome pictures! Thanks for linking, I always like seeing what's going on with you! I really like how you managed your long windy run. Smart thinking. Your jumping picture in the tie-dye shirt is my favorite this week (you always have such great pictures!). Posters and art projects were always such a challenge at our house! But we got them done! Thanks for linking with us, Christy! At first I thought your dog had your leg in his mouth biting you in that picture! I loved 4-H when I was a child. Living in suburbia, my sons didn't have an opportunity to participate. Don't let your babies grow up to be runners. A New Year, Same Old Me!